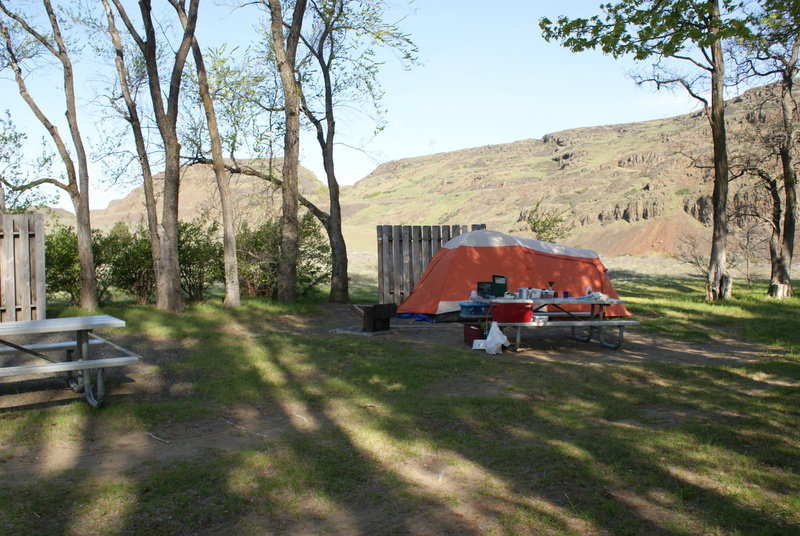 In early April, there aren’t very many places to camp in Eastern Washington. 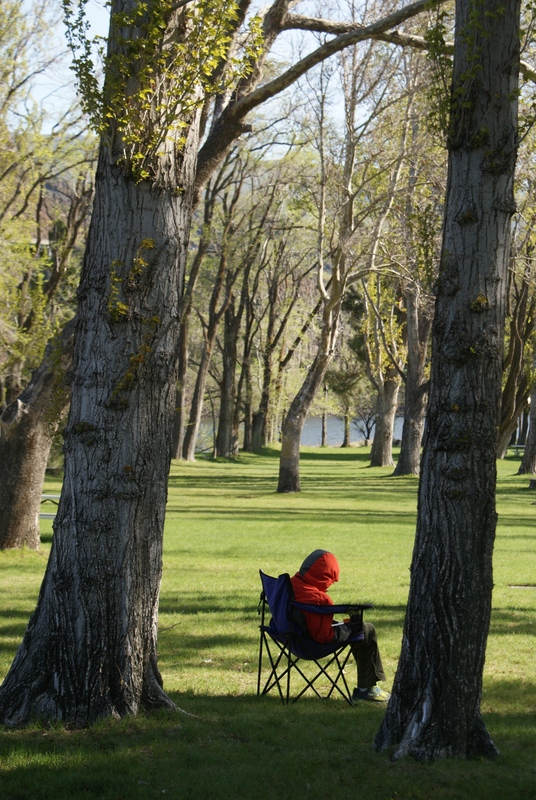 The Forest Service campgrounds stay closed until Memorial Day or later. 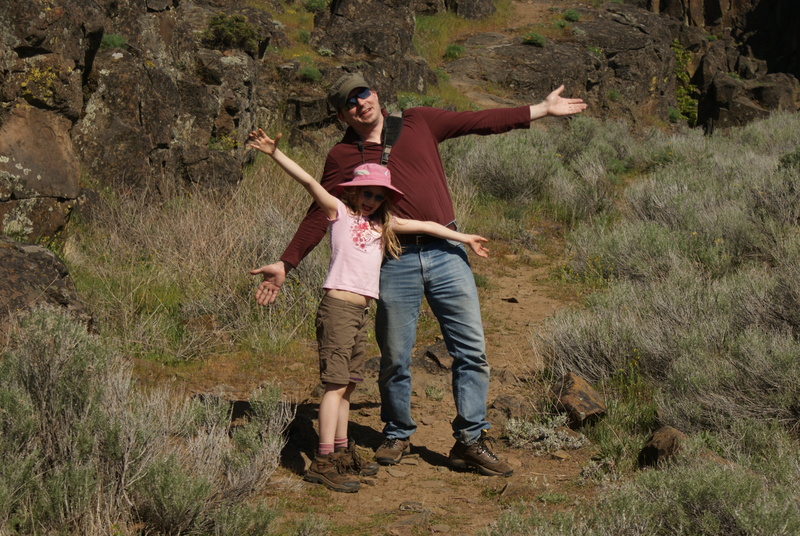 So we camped for two nights during Spring Break at Columbia Hills State Park, at Horsethief Lake. I had stayed there last year for my little retreat, and knew what to expect, but the kids were grumpy about the setting, the lack of privacy, and how open it was. But, we were able to talk with the Ranger when we pulled in, and he gave us a bunch of helpful information about things to do in the area and what was happening at the park. 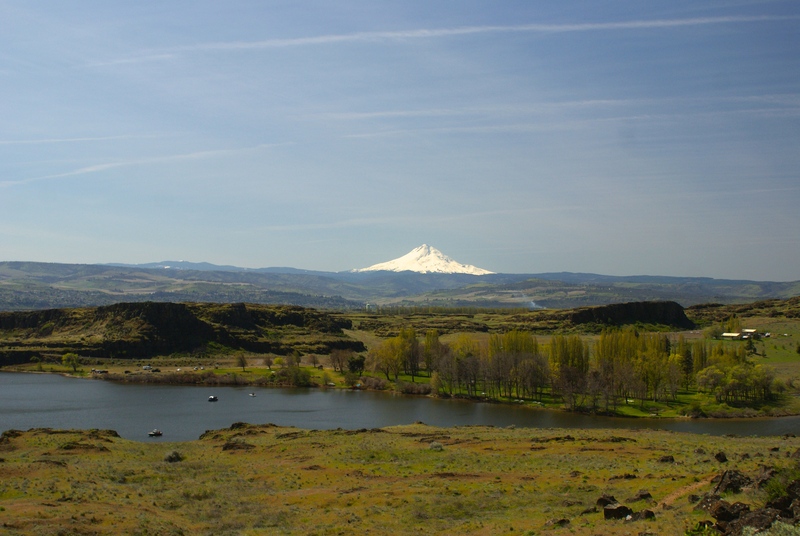 After we set camp up and had dinner, we debated whether to take advantage of the clear evening to go up to Goldendale to the observatory there. The ranger had highly recommended it, and said it wasn’t far. So, even though we had spent the day exploring and driving, we piled back in the car and went up there (I’ll post a separate post about that later!). We got back well after dark, and piled into bed. All was calm until around 1 am, when the wind picked up. It sounded like a freight train rolling through our campsite, gusty and frightening. It woke all of us up, and the real trains passing through all night, blowing their horns and rumbling, didn’t help matters. We all laid there until one by one we drifted uneasily back to sleep. Things were much calmer in the morning, and we woke to another sunny day. We couldn’t complain about that, at least! 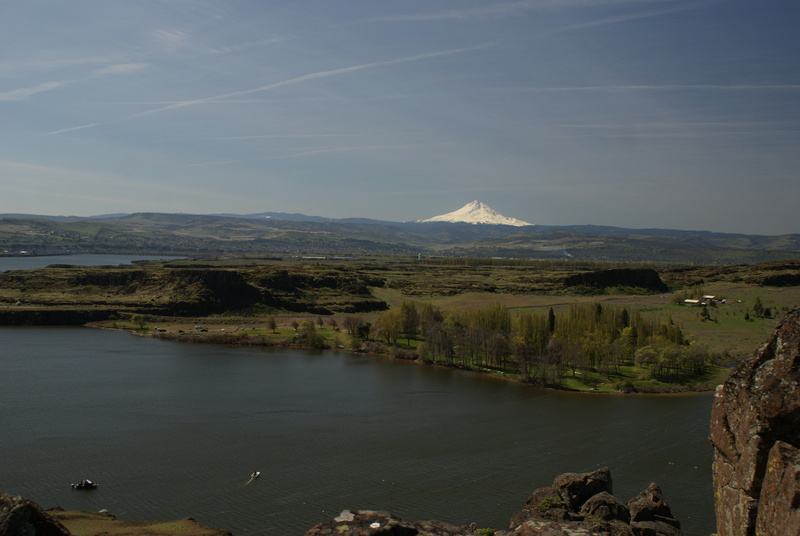 We ate breakfast, got our things together, and went to The Dalles to the Columbia Gorge Discovery Center (that will have a post of its own, too.) 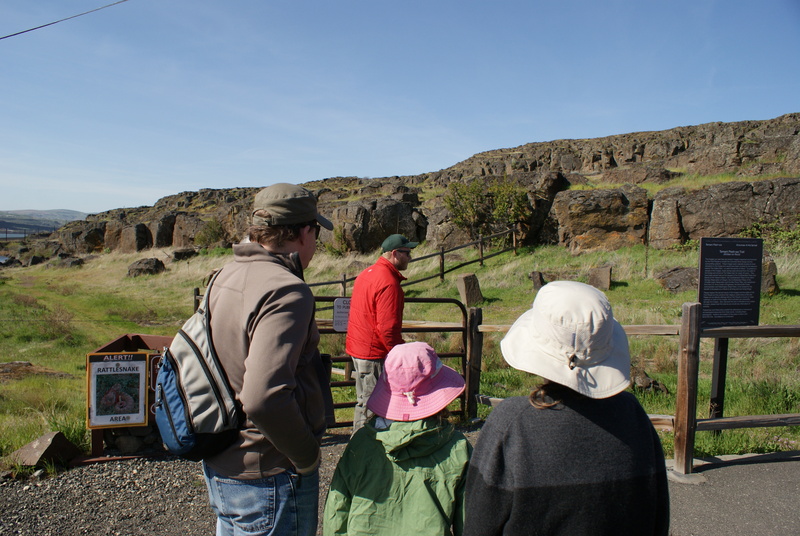 The Dalles looks like a fun place to explore more, and there were a few attractions there we would like to go back to. Our second night at the park saw more campers, but the wind stayed lower. 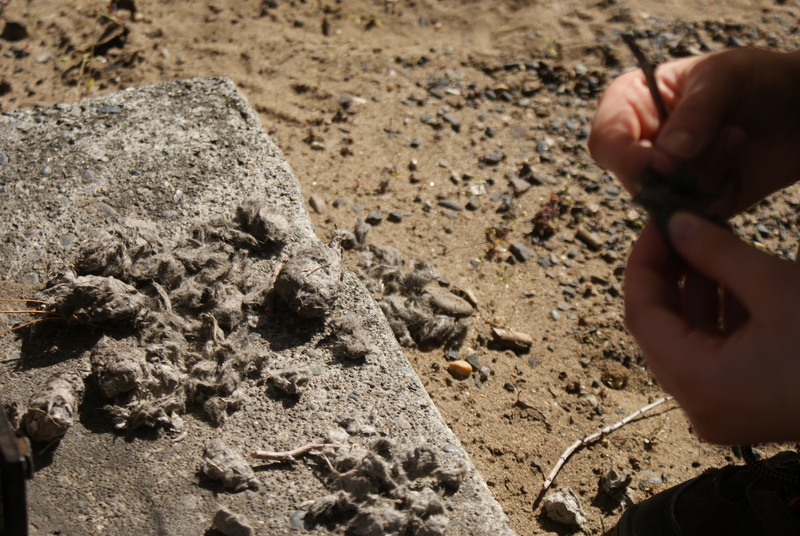 We had noticed some sort of owl pellets on the ground around the trees, and Annika had taken some apart. That second evening, I heard two great-horned owls hooting at each other from the trees. We excitedly but quietly got our binoculars and ventured over to see if we could see them in the dusky light. We were fortunate to be able to see one fly to its nest, and mentally marked the location so we could check it out in the morning. 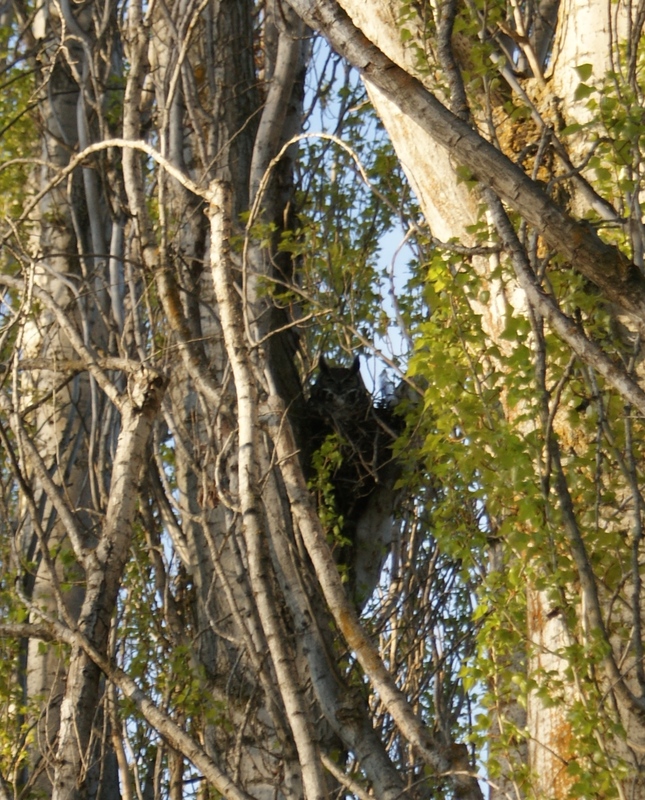 We heard the owls call intermittently throughout that second night, and in the morning we found the tree with the nest. It was a really cool experience to see the pair and their home, to hear them, to see evidence of their meals, and just to know there was such interesting life in an otherwise underwhelming camping area. After the tour we had lunch, then drove around to Hosethief Butte. 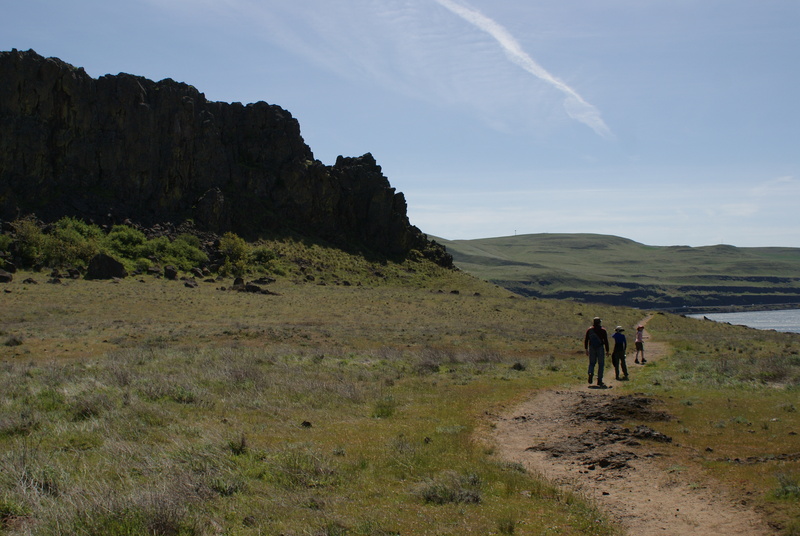 We took the trail around the south side of the butte, and up into the middle, where there are some different scrambling routes to the top. Annika found this part challenging, but she made it, and we enjoyed the views. Several folks were rock climbing different sections of the Butte. 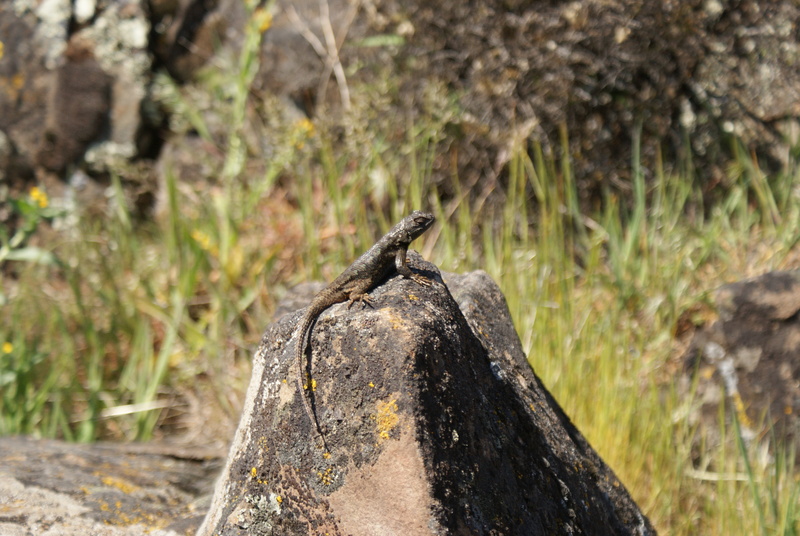 We saw little lizards, butterflies, birds, flowers, and took in the sights up and down the Gorge. There is a third section to the park, which we didn’t have time to explore. Dalles Mountain Ranch is just west of the Horsethief Lake entrance, and apparently you can see some old farm equipment among the spring wildflowers and wide-ranging views. We do hope to go back there another time. We ended our trip heading back west and stopping at Bonneville Dam. That area deserves a whole post of its own, so stay tuned in the next week and I hope to get that up soon. We really enjoyed this area of the state. The kids warmed up to the camping at the State Park, but admittedly it was low on their list of places we’ve stayed. 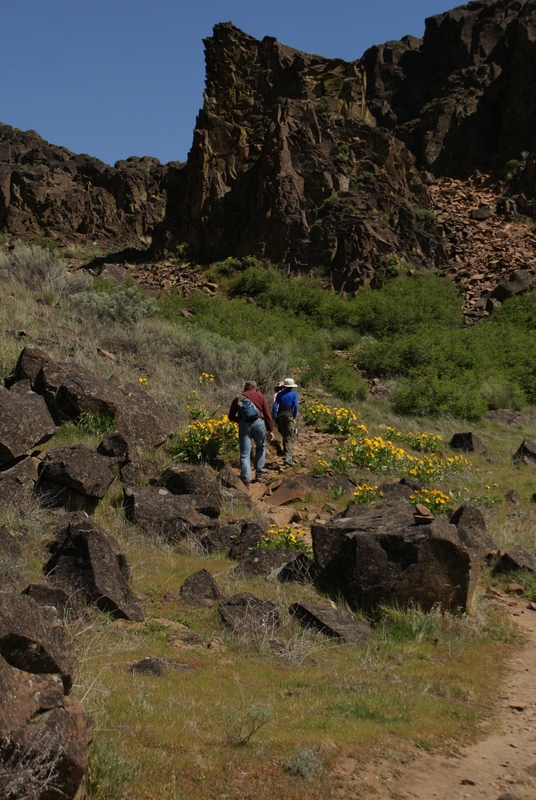 The flowers, birds, rocks, history, views, sunshine – it all makes for a unique and fulfilling area to visit, especially in the spring.